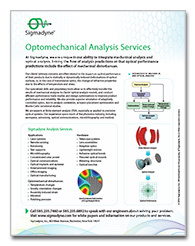 Effective optomechanical analysis requires integrating the disciplines of mechanical analysis and optical analysis. Effective opto-mechanical analysis requires integrating the disciplines of mechanical analysis and optical analysis so that the impact of mechanical disturbances on optical performance may be predicted. Sigmadyne accomplishes such integration with custom tools and expertise. Mechanical behaviors that may need consideration in an optical performance analysis include optical surface motion and deformation, temperature-induced refractive index changes of transmissive optics, and stress-induced refractive index changes of transmissive optics. For example, the deformations, temperatures, and stresses in a lens barrel due to absorption of the transmitted light are predicted by a finite element analysis in the example shown. Figure 1 – Deformation of optical surfaces and refractive index changes due to temperature changes and induced stresses all affect optical performance and can be simulated in integrated optomechanical analysis. The optical surface deformations may be characterized by means importable to optical analysis. Additionally, the thermo-optic effects due to the temperature changes and the stress-optic effects due to the stresses are formatted into optical path difference maps in Zernike polynomial format or a gradient index lens database. All of these descriptions may be imported into optical analysis software to generate optical performance such as the modulation transfer functions or spot diagrams. Figure 2 – Degredation in optical performance due to mechanical disturbances may be computed in the optical analysis software after results generated with SigFit are applied. If polarization were important for this application, then a phase map due to the stress-induced birefringence could be generated for import into optical software. Sigmadyne has applied such integrated analysis to a wide variety of optical systems such as telescopes, projections systems, office imaging units, laser systems, and telecommunications components.